With this step-by-step guide about how to grow dill you can have a regular supply of fresh dill leaves and seeds for use in your recipes. This versatile herb is particularly good in salads and complements fish nicely. It also is good for making dressings, vinegars and works particularly well when making homemade pickling spices. 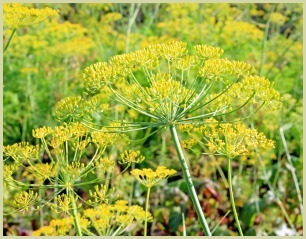 If you grow fennel as well, keep the two herbs well separated to prevent cross pollination. Dill plants enjoy well-drained, poor soil in full sunlight but must be kept well watered to prevent them getting straggly and weak. You can sow straight in the ground after the last frost or indoors, and they are very happy in containers. After the date of the last frost, plant out any seedlings you may have sown earlier 8-9 inches (20-23cm) apart. Fill a container or pot with general potting compost and scatter over the dill seeds. Cover with ¼ (1cm) inch of compost and water. In 8 weeks harvest the young leaves. Make successive sowings 6-8 weeks apart. Remove slugs and caterpillars by hand. Once the plant has flowered, chop and gather 5-6 flower heads. Cover the heads with a paper bag and seal with an elastic band. Hang upside down in a warm, dry place for 7-10 days. Rub with your fingers and the seeds will drop off. Store these in an airtight jar.